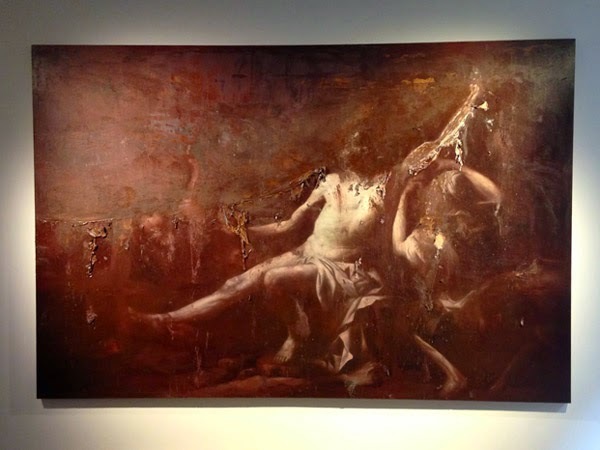 The painter and sculptor Nicola Samori succeeds where most contemporay artist fila - coupling original, contemporary artistic practice with a consciousness of the History of Art. Working from his studio in the unremarkable, typically Italian town of Bagnacavallo, Samori´s delicately wrought Old Master-esque painting are subject to violent traumas, their faces oozing oil paint that drips down teh canvas while onyx and marble are contorted into liquid froms. In his first solo show in the UK, L’Âge Mûr at the Rosenfeld Porcini Gallery in London, Samori is quietly brilliant. His painterly skill is evident in his work - rendering Caravaggesque forms in a perfect chiaroscuro or the ghostly impressions of a face or figures. And if he were simply regurgitating long established styles of long dead masters Samori would be well remunerated. But what makes his work so exciting, so original and contemporary, is the obfuscation of his traditional skill. Perfectly executed faces, as in Caton 2014, are viscerally scraped down the work, layers of oil peeled back to expose a muddied under-painting. The illusion of space and light, painstakingly created by Samori, is quite suddenly disrupted by the trauma caused to its surface, inadvertently accentuating the artist’s illusionistic skill. In this instance, Samori’s play between depicted and real, fictious and physical materials, is highlighted by the figure of the painting appearing to be the one causing such violence both to his face and to the picture plane. In many ways here, Samori is referencing Damien Hirst as much as he does Old Masters. Samori manages to present death and violent disfigurement in an acceptable way by relating damage to the body - that ruptures the accepted, sanitised surface and confronts the disturbing organic reality beneath - to the damage the artist causes to illusion of space. As with Hirst’s shark or series of dissected farm animals, presenting death and disfiguration in a palatable way encourages the viewer to consider their subconsciously ignored physicality and, ultimately, mortality. Samori also nods to older artists through his materials. The practice of painting and sculpture is becoming increasingly less relevant in contemporary art. But Samori not only flies in the face of this trend but actively revives and develops techniques that were used by the Old Masters. In painting on copper, Samori looks towards small format works that capitalised on the metal’s ability to create a unique form of light. In painting on pieces of copper measuring, at their largest, 1.8m by 1.2m, and in other works cutting into the copper to form the image, Samori is creating art with traditional materials in a completely original way. Samori, then, is a unique artist. While most of contemporary art is moving away from the materials and figuration of the past, away from traditional methods and education, Samori manages to reference the much older artwork while creating something wholly new. With Frieze London just past, an art fair dominated by installation work with little consideration for the dusty halls of Art History, Samori’s exhibition is unexpectedly refreshing. 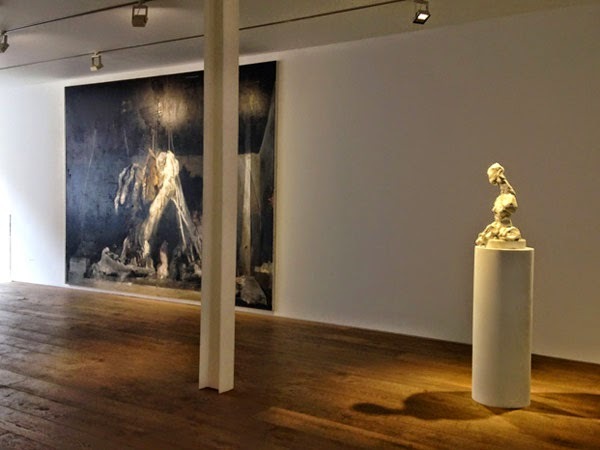 L’Âge Mûr will run at the Rosenfeld Porcini Gallery at 37 Rathbone Street, London, W1T 1NZ until 17th November.